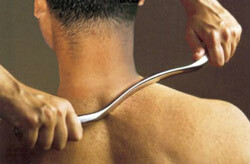 Our stainless steel instruments allow us to access the deeper, more significant soft tissue problems. The hand instruments we use allow a deeper, more sensitive palpation and treatment of restricted tissues. Since the metal instruments do not compress like the fat pads of the fingers, deeper restrictions can be accessed and resolved. Plus, their concave/convex shapes mold to the various contours of your body for greater comfort and effectiveness. As we pull our instruments across adhesions and scar tissue, patients report a temporary tightening, then a pleasant sense of release. Repeated visits help resolve these areas of scar tissue and improved muscle tone can be restored.